“Ora ho capito!” he said, meaning that he thought he’d finally got the hang of pruning our three medium-sized, relatively young olive trees, and he wielded his long-armed pruner dangerously, confidently lopping great lengths of olive wood and their silver-green leaves. 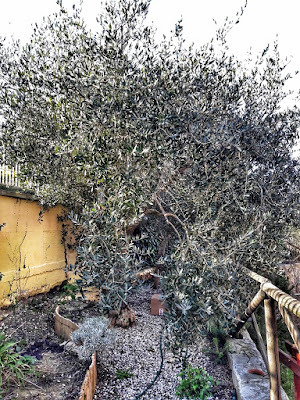 I looked on dubiously, ducking the falling branches, and thought how unlikely we were to ever get an olive crop again. Pruning olive trees is an art. It is not a task for the novice gardener. Here in Tuscany, I tried to follow a short course in olive pruning once, but was soon lost in a forest of Italian horticultural terminology and came away none the wiser. It really seems to be “a mystery buried deep in ancient folklore”, as the Mediterranean Gardener puts it. And yet we have young(ish) Italian friends who will confidently and competently tackle the task, leaving lovely trees looking shaved but still harmonious, with no lopsided branches to be seen. I think it's probably one of those tasks you have to have grown up with, watching your elders as a child and then gradually absorbing their techniques to perfection, like cooking at your grandmother's side. Unfortunately, in my youth there weren't many olive trees around in Shropshire to make this possible (and not so many even now, I suspect), but my olive trees have more of a decorative role than anything else and I do not depend on them for a harvest, so the occasional haphazard pruning upsets only my sense of harmony. A great little festival took place over the weekend (30-31st Jan) at the Nuovo Teatro delle Commedie, Livorno's tiny theatre with adjacent bar and event space. Showcasing the artisan creations of seven Tuscan breweries, the event - 43 Calorie Premium Beer Festival - focussed on the nutritional benefits of beer, including an interesting talk on Saturday afternoon by Luca Gatteschi, a nutritionist for Italy's national football team. Dr Gatteschi gave a detailed presentation of the dietary pros and cons of ale, assuring us that it really is ok to drink beer (as if we needed telling), although perhaps not right before competing in a sports event! The talk was followed by a well-attended, palate-stimulating tasting session of five of the craft beers featured at the festival. Several of the participants confessed to brewing their own beer at home, showing that the artisan beer craze is infiltrating even the staunch wine territory of Tuscany. In fact, there are currently getting on for one hundred artisan breweries in Tuscany alone, with many more in other regions, especially in the north. Unfortunately my own time constrictions meant that I missed the live music later in the evening, as well as all of Sunday's events, but let's hope there will be a second edition of this intimate presentation of local Italian beers, perhaps with a new selection of breweries, next year. Piccolo Birrificio Clandestino, Livorno's first and only artisan brewery which was begun in 2010 and now boasts 14 labels. The team has won several prizes and has been recognised by the Slow Food organisation. It is possible to visit their premises by prior arrangement (see website), and they also have their own pub in Via Solferino. Birrificio Agricolo Artigianale J63, otherwise known as Julia Sessantatre, situated in the village of Cenaia, in the Province of Pisa. This is an 'agricultural brewery', a term introduced in 2010 by Italian laws governing the classification of beer, meaning that at least 51% of of the raw materials are brewery grown. The J63 brewpub, serving its 5 craft labels, is open in the evenings from Wednesday to Sunday. Opificio Birrario was founded in 2012 by three friends with a passion for beer-making. Located in Lavoria, in the Province of Pisa, this is another 'agricultural brewery' where most of the cereals and hops needed to make their five beers are home-grown. Four of their beers are named after species of owls. The fifth and newest beer is instead called Demetra, after the goddess of the harvest and fertility, and contains 100% locally-grown ingredients, a first in Tuscany. Birrificio Badalà, founded in Prato just two years ago in 2014, produces six different beers including an usual smoked beer made from chestnut flour, called Fuma.a. Their site includes an online store. Birrificio Apuano from Massa, named after the Apuane mountains that lie behind the town in northern Tuscany. The brewery was founded by two friends, both homebrewers, and has been in action since 2002. They make personalised beers for third parties as well as personalised labels of their own production. Birrificio Angel/Fermento Libero is based in Prato and has been operating since 2012. The two partners both come from a background in textiles, but decided to dedicate themselves to the art of beermaking, following courses in craft brewing in order to obtain the necessary know-how. They produce four beers named after local landmarks. Birrificio dell'Elba from Portoferraio on the island of Elba (Livorno Province), was founded in 2007 by Laura who wanted to open a pub, and Valerio who loved making beer. Together they have built up their business, now making 12 different beers. CACCIUCCO PRIDE - a novel new event for Livorno? Cacciucco Pride – now there’s a thought! How ingenious and progressive of our city councillor for tourism to think of creating an event to celebrate both Livorno’s signature fish dish Cacciucco AND LGBT culture in one huge three-day extravaganza! I really think he might be onto something! This could be the international tourist attraction that Livorno has long been looking for, taking the meaning of Cacciucco to new dimensions and introducing the spicy fish stew to a much wider audience. After all, Livorno has always had a vibrant, variegated population of widely different backgrounds, so what better place to hold what might even become Italy’s largest “Food&Pride” event. Cacciucco Pride 2016. Already looking forward to it! The dreaded letter has arrived! Every year in the run up to Easter the local parish sends round its schedule for Easter Blessings. The detailed timetable lists a date and time for every street in the area so that you know when the local priest is due to show up on your doorstep to deliver his 'benedizione'. Although I don't actually know what a blessing from a Catholic (or any other) priest really involves, this annual announcement fills me with apprehension and I make a bold mental note to be out at that time. I wish I had the guts to wait for the doorbell to ring and then shout a cheerful and guilt-free 'no thank you!' from my doorstep, but instead, if I am in, I hide behind the curtains like a parishioner who hasn't showed up at mass for months. This year I note that the the priest's cell phone number is printed at the bottom of the page, perhaps so that residents like me can let him know they probably won't be in. What a soul-destroying task I have made for myself, trudging round the shops of Livorno with the aim of updating the shopping pages on my website and, perhaps, introducing it to a few more people. The thought of succeeding in selling a paid advert lingers only very vaguely at the back of my mind, as I am the world's worst salesperson, and Livornese shopkeepers seem obstinately opposed to advertising, particularly on 'some English website' (of all things). That, at least, I have learnt by now. However, I do feel slightly more confident than I did six years ago when the site was in its infancy - now that I can quote some respectable visitor data, and perhaps just because I am older, and wiser about so many things. BUT the despondency is quick to set in. All I am asking is for some basic details about each shop so that I can create a FREE listing, or update an existing one. But my stuttered Italian is barely listened to (why does my clumsy English accent leap to the surface in these situations?! ), while the expressions of disinterest, suspicion, and in some cases, pure panic on the faces of shop staff are enough to send me backing apologetically through the door. Why I am doing this? Merely because I feel a duty to visitors to the Livorno Now website (115,000 in the past year) to provide clear and up-to-date information about the city and its services. With this in mind, my experiences with shopkeepers don't really matter. I must say that there have been some heart-warming exceptions. I have met and had enjoyable and profitable conversations with a handful of friendly, positive and appreciative Livornese shopkeepers. 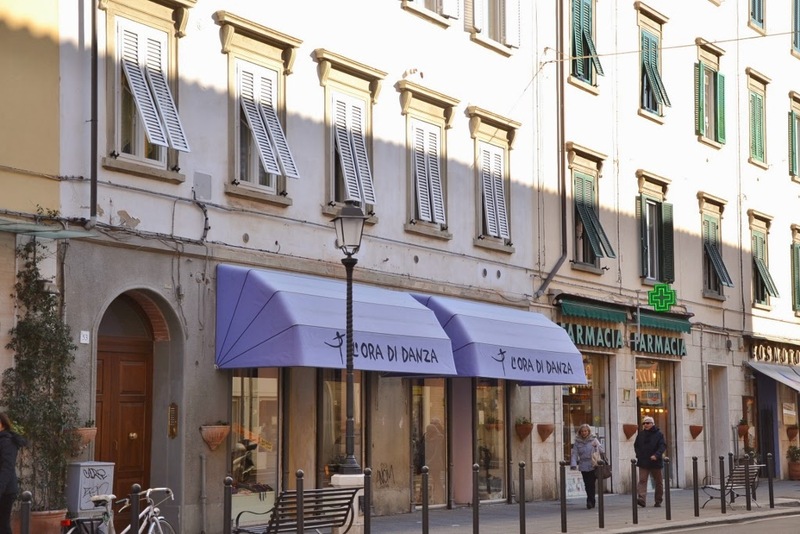 In fact, I would like to say a public thank you in particular to Succo di Lana (great fashions in Via Grande), Pasticceria Cerretini (the ONLY real Cerretini in Livorno), Gran Porto Bar (run by business-minded Florentines), and Caffé Mori (where they even offered me a coffee!). Thank you all for your interest and encouragement. It makes it all worthwhile! Deciphering Italy - Rimandato or Bocciato? For many Italian school students the summer will not have been quite the break from studies they would have preferred. The three months of summer vacation will have been marred by the prospect of, and more importantly preparation for, exams in up to three subjects to be taken in September (sometimes August), the results of which determine access to the next school year. These are pupils, generally at high school level (Scuola superiore - ages 14-19), who during the previous academic year failed to reach an average pass mark of 6/10 in one or more subjects. In other words, they have an insufficienza (a fail) in up to three subjects which they are given a chance to make up (recuperare) by sitting these exams, known as esami di recupero. Schools sometimes offer short remedial courses at the end of the school year to help students to identify their specific problems in the subjects they have failed. This system is rarely used in primary or middle schools, but is common at high school level. Students who fail to meet the average pass mark in more than four subjects will not necessarily be given a chance to take the esami di recupero (depending on teachers’ discretion) and will be failed directly. When a student has been bocciato, he or she has to repeat the whole school year again. This means dropping back into the class below, for all subjects, for the entire year, and continuing in this class for the rest of the time at that school, unless he or she fails again. It is not uncommon for students to fail more than one year of their high school education, although not usually the same one. As a result, students can end up finishing their high school education in their early 20s (instead of 19). P for Principiante - and suddenly I'm a driving instructor! Not too long ago I was pulling my hair out at the thought of my then 16-year-old riding a moped (see previous post). Now we have progressed to getting a licence to drive a car and I've just had a 30cm sq adhesive bearing a large black P, for Principiante ("beginner") stuck to the rear windscreen of my Fiat Panda and am being pestered, frequently, by the same son to take him out driving. Help! You have to be 18 to drive a car in Italy. The test has changed quite a lot in recent years as Italy comes into line with EC regulations, but the paper work is less than streamlined. And as I have a natural aversion to all public offices and bureaucracy, it took me a while to make my first visit to the Motorizzazione (Motor Vehicle Department). I had to wait about ten minutes in a worn-out looking office piled high with paperwork before the clerk appeared. Several of his colleagues came in while I was waiting, also looking for him, but hardly acknowledging my presence. Coffee break, perhaps. I was eventually issued with several forms to fill in, along with three "bollettini" to pay, and told to make an appointment for my son's medical examination, and to come back to book the theory test when I had done all this. So, off to the Post Office to pay the three taxes, two of 14.62 and one of 24 euros, all made out to the Dipartimento Trasporti Terrestri. Endless queues at the Post Office, naturally. Next stop, the local health unit that deals with driving licence medical examinations. It was nearly lunchtime and most of the offices seemed to be already closed. But I've been in Italy long enough to know there is usually a way round a minor problem like this. I accosted a passing member of staff in a white coat who turned out to be a doctor. "Ring this number," he said, as he scribbled it in black felt tip pen on the back of the form I had brought from the Motorizzazione. When I got home, I rang the number I'd been given and was surprised to get an appointment for the following week. Before then, I was told, I had to be sure to pay another 14.62 euros tax, and a fee of 50 euros for the examination. Well, a week went by and my son went off for his medical, but came home looking annoyed. I'd got it wrong. He was supposed to have taken a medical certificate with him signed by his own doctor, and just get an eye test at the health unit! That piece of information obviously hadn't sunk in (or maybe it was just that no-one had told me...). Anyway, he'd had the eye test, but needed the doctor's certificate before they would issue the form he needed for the Motorizzazione. Off to our family doctor. He filled out the necessary form, giving my son a full bill of health, and charged me 50 euros (with a receipt). When I finally found the time, I then went back to the health centre with the doctor's medical report, in exchange for which I was issued with the certificate I needed to book the driving theory test. A few weeks later, before the test, my son's ID card had disappeared. I'd turned the house upside down before it occurred to me that maybe, just maybe I might have left it at the motor vehicle dept! So back I went, queued up, enquired, was sent to another office, queued up, and finally found the missing ID sitting on someone's desk. "Oh, is this it?" asked the lady. "They must have forgotten to give it back to you." Well, thanks for letting me know! The theory test went well. So now we're on to the practical. You have to sign up with a driving school for a minimum of six hours of lessons. If you want to save some money (which wouldn't be a bad thing at this stage), the rest you do with your parents or any other unsuspecting volunteer (oh, and it costs 300 euros to sign up with the driving school, including two "free" lessons. Ha! ).